I know summer has just begun, but we are already excited for class to start up again this fall and to welcome you all to the University of Iowa. Orientation is one of your first college experiences as you will get familiar with campus and pick out your first class schedule. 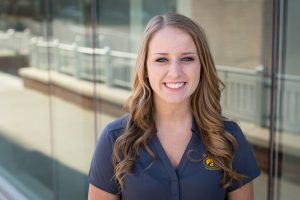 As someone who is returning to work for Orientation Services for the second year and a recent graduate of the University of Iowa, I have a few tips on how to have a successful orientation program! Upload your student ID picture at least 7 days prior to your orientation program for it to be ready for pick-up when you arrive on campus. Make sure you know your Hawk ID (usually a name/letter combination) and password. An example of a HawkID for Joe Doe would be jdoe. Finish part one of Success at Iowa online on your ICON account. Take your placement tests such as the ALEKS Math Placement Test to ensure that your class registration goes smoothly. Download the app HawkTools if you would like to access the 2-day orientation program agenda in advance. Wear comfortable clothes and shoes. Iowa summers get hot and humid but also know that some buildings may be cold due to air-conditioning. Plan for plenty of walking and bring a water bottle to stay hydrated. Bring a swimsuit or work-out clothes if you would like to take part in our late-night activity at the Campus Recreation & Well Center (CRWC). If you stay in the residence halls, you will be given sheets, bedspread, towels, a washcloth, and a pillow. However, feel free to bring your own pillows or blankets if that helps you sleep better. Bring toiletries and shower shoes if you plan on showering in the residence halls. Orientation can be a nerve-racking time for a lot of students but having a positive attitude can make the experience more enjoyable. Be ready to be adaptable and take advantage of getting to know your peers! Start thinking about your future and potential majors or careers that grab your attention. Think about your strengths, weaknesses, and relevant class, work, or volunteer experiences that have influenced you. Keep your family, guests, and friends in the loop and think about sharing your expectations for college with each other on the drive up. Take photos and share them on social media. If you use the hashtag #UIOrientation, you will be entered in to win a Hawk Shop giftcard! We are all looking forward to meeting you soon! I hope you found these tips helpful. As always, Go Hawks! With just months left until you begin your first college classes at the University of Iowa, I want to remind you of resources available to help you succeed academically and personally at the University of Iowa! At your summer orientation program, you will meet your academic advisor and select your classes for the fall semester. Your academic advisor is a wonderful resource to you throughout all of your years in college, but most importantly your first semester. Your Academic Advisor can help provide insight to help you decide what you would like to major in, how classes can best fit your interests, help you create a balance between schoolwork and having free time or being involved on campus. They are like a one-stop-shop for any questions on how to succeed your first semester. It is important to focus on your academics upon arrival to Iowa, and seek out resources that will help you do your best in your classes. Supplemental Instruction is a free resource offered for assistance in many of the classes students will take during their first year at Iowa. It is a tutoring session led by an upperclassman who has previously exceled in the course. The Academic Resource Center (ARC), located in the Iowa Memorial Union, assists students with finding tutoring opportunities, but is also a great place to start learning about our other tutoring centers on campus. Learn more about the opportunities here. Don’t forget to have fun and get involved on campus! If you have questions about different student organizations or how to take the first steps to being involved, make sure to stop by the Pick One Fair during On Iowa! or reach out to the Center for Student Involvement and Leadership. Remember there are over 500 different student organizations and ways to make connections on campus! Each day, it is getting closer to the deadline to accept your offer of admission. The last day to accept your offer of admission to the University of Iowa is May 1st , and we want to do everything possible to help you make your decision. Do you feel comfortable on campus? Does the University of Iowa feel like home? What do you see yourself getting involved in on campus? Is this the right financial fit? Consider visiting campus! If you have not visited the University of Iowa yet, we strongly encourage that you do so before May 1st. If you have been to campus before, we would love to welcome you back! This is a great opportunity to ask questions to our current University of Iowa students. By visiting campus you can gain a better feel for the way campus is set up and where you will be spending your time as a student for the next four years. We would also encourage you to explore downtown Iowa City and get a taste for the local culture that makes up our eclectic college town. Click HERE to schedule a visit, or call our Admissions Visitor Center at 319-335-1566. In the end, trust your gut. If Iowa feels like home and you are excited about all of the opportunities that come with attending a Big 10 institution with a small town feel, make sure you accept your offer of admission via your admissions profile by the May 1st deadline. We are excited to welcome you to the Hawkeye Family, and we hope to see you on campus this fall! It’s about four months away from your high school graduation, congratulations! But don’t forget about your long-term goals. Before you know it, you will be caught up in the excitement with the end of high school activities, hanging out with friends, and preparing for your summer festivities. While these are all things to look forward to, there are some key factors to keep in mind over the next few months to prepare you for college and set yourself up for success. First, don’t forget to finish strong in your classes! Your grades still matter. 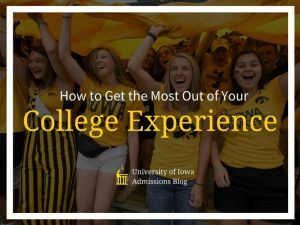 Even though you have already been admitted to Iowa or other institutions, you still need to try to get the best grades possible. Colleges will be requesting your final transcripts upon high school graduation. These final grades will be used to confirm that you are in good academic standing prior to starting at the University of Iowa. Next, you should apply for scholarships within your community. Work with your high school counselor to find scholarship opportunities. Many times, your high school counselor will have some great pointers or places to begin searching for outside scholarships. Also, consider looking at scholarships on a national level, such as databases like Fastweb and College Board. Over your high school career you may have taken Advance Placement (AP), International Baccalaureate Program (IB), or College Level Examination Program (CLEP) courses. Now, you might be wondering if you can receive college credit for your hard work in these classes. Visit our Credit by Exam Options to see how you can earn college credit before you arrive on campus. This will free up time and money to potentially pursue a double major, an additional minor, and/or a study abroad experience. If you have not applied to the University of Iowa yet, but still have interest in attending, our application deadline is quickly approaching on March 1st! Apply now, HERE! For students who have applied and been admitted, you have until May 1st to accept your offer of admission. You can accept your offer of admission via your admission profile by paying the $250 acceptance fee. Enjoy your last few months of high school, and welcome to the Hawkeye family! Visiting a college campus is one of the most important and helpful things a student can do in their process to select the college that is the best fit. 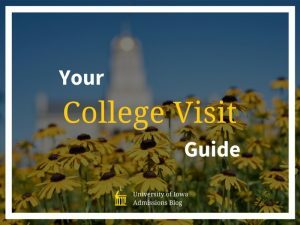 Here are a few tips and tricks to consider to make sure you will get the most out of your visit to campus at the University of Iowa and ways to make it memorable. Reflect on what are the most important factors a school needs to have for you to attend. Research Iowa City and see if there are other things you would like to do outside of your scheduled visit. Begin to think about what you might like to study in college. What is your major? At Iowa we offer over 200 areas of study, you can learn more here. Make the most of your campus tour! Be sure to ask your tour guides about their student experience, see how they are involved on campus, ask for advice about what they wish they had known before coming to college, etc. Get all of your questions answered! Make sure you come prepared with some questions about your college “deal-breakers”- what do you want to make sure the University of Iowa offers to ensure you the best possible college experience. Talk to your tour guides, speak with Admissions staff, ask questions during the presentation! Remember, this campus visit is about you- the people who you come in contact with during your visit are there to help you determine if Iowa is the right fit for you, so if there is something you are dying to know more about, don’t be afraid to speak up! While on campus, I would encourage you to also check out our eclectic Downtown Iowa City with over 70+ restaurants and unique boutiques to shop, conveniently located directly across the street from the Pentacrest. Begin to explore the city you might call home for the next four years! There are multiple coffee shops that students make their own over their time at Iowa and are popular study spots! Be sure to check out Java House on Washington Street for a taste of local flavor and a glimpse of what could be a part of your future study routine. Attend an athletic event! Tickets to men’s and women’s basketball games, wrestling meets, swimming and many more are available here. Visit the FREE museums on campus! The University of Iowa Museum of Art. Hang out with Rusty at the University of Iowa Museum of Natural History. Learn about Iowa’s history at the Old Capitol Museum. See what student events are happening on campus (everything from campus speakers, to author readings at Prairie Lights, or arts events). Watch an artistic performance at Hancher Auditorium. Go hiking at Squire Point or take in some awesome views at the Coralville Lake Reservoir. Visiting a college campus is an exciting time, so don’t forget to have fun and take lots of pictures. I recommend also taking a minute or two after your visit to write down how the campus made you feel. This will help when you are comparing colleges after you have gone on several college visits. If you have questions regarding your campus visit, or would like to schedule one, please do not hesitate to contact the Office of Admissions at 319-335-1566. The University of Iowa is a welcoming and inspiring place where you can focus on your studies and engage in a multitude of opportunities beyond the classroom. As a May 2015 graduate from the University of Iowa, I valued my time in the classroom, but I also learned that it is important to take time to involve yourself in the Iowa City community. Here are some tips and tricks! I cannot stress the importance of getting involved. There are over 500 different student organizations at the University of Iowa, and this number continues to grow. In addition to the opportunities already available, students have the ability to create their own student organizations. To see student organizations that you can join as a member of the Hawkeye family, visit http://uiowa.orgsync.com/. Future Hawkeyes will have opportunities to learn more about individual student organizations at their summer orientation program, the student organization fair at On Iowa!, by informational emails sent to their University of Iowa email address, and throughout the semester by word of mouth. At the University of Iowa, 27% of undergraduate students participate in research. The University of Iowa is a Tier 1 research institution, meaning that all professors at Iowa, in all departments, are conducting research and developing new discoveries in their respective fields. Because all professors are engaging in research, students can speak with their individual professors to see how they can get involved in research. Discover more about research at Iowa here: https://uiowa.edu/icru/. Gain experience for your Résumé! All of the activities listed above can be used to enhance your college résumé, but be sure to also check out the resources made available by the Pomerantz Career Center. The Pomerantz Career Center hosts opportunities for résumé workshops and mock interviews, and Career Advisors will assist you in writing a cover letter. Most importantly, they provide resources that help students find jobs. The Pomerantz Career Center hosts career fairs that hundreds of employers from across the nation attend with the intention of hiring our Hawkeyes! This is a great opportunity for students who are looking for jobs while they are current students at Iowa, for future internship experiences, and full-time employment. Students can look for jobs on campus, within the community, and across the nation by using Hireahawk.com, a resource managed by our career center. To learn more, visit the Pomerantz Career Center’s website at: https://careers.uiowa.edu/. You may be thinking that college graduation is far away, but your time at Iowa will fly by, so be sure expand your horizons, try new things, and develop your passions! If you would like more information, do not hesitate to contact the Office of Admissions at 319-335-1566 to ask your specific questions! Go Hawks! The University of Iowa has a wonderful Honors Program and we’re here to tell you all about why you’d want to join. Program acceptance comes with benefits, challenges, and opportunities. It’s not going to be easy, but it will be worth it! The program provides both structure and flexibility in academics. We are a research 1 institution, which means students can pursue research in any field. We’re a large school that provides scope for all sorts of interests, so you can make friends in areas ranging from arts to clubs and sports. Students are encouraged to develop the skills they will need to pursue their passions both during their time here and after graduation. 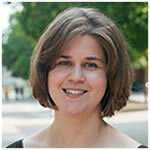 Attend honors seminars and classes and receive specialized support from Honors Program staff. Make friends with common interests – intellectual pursuits and fun alike. We mentioned that there are opportunities that come with going through the Honors Program. Here are just a handful of examples of what we mean! For our health sciences students: volunteering, job shadowing, or doing research with faculty members in our hospitals and clinics. The Center for Computer-Aided Design has undergraduates from disciplines like engineering, human physiology, and computer sciences involved in cutting-edge research alongside grad students and faculty. Business students can hone their skills in the Hawkinson Institute of Business Finance, the Vaughan Institute of Risk Management & Insurance, and the Iowa Electronic Markets. Students in the arts and humanities benefit from Iowa City being the cultural capitol of the state – we’re the only UNESCO City of Literature in North America and the home to the Iowa Writer’s Workshop, plus we have a thriving arts campus with 3 new high-quality arts and music buildings opening in 2016! Fall just short of those requirements? You can apply through the Selective Admission process. No application necessary for students who meet Honors Program admission standards. If you’re still not sold, don’t hesitate to contact the Office of Admissions or the Honors Program directly to ask your specific questions! Upload your Iowa One Card photo on MyUI so you’re able to easily pick up your student ID at Orientation. Don’t forget to complete Part 1 of Success at Iowa on ICON. Take any necessary Placement Tests to keep your academic advisers happy. Bring your parents with you. Sometimes your family can be just as curious as you are. Bring your family to Orientation to participate in the Family and Guest Program. During this program, your family will receive important information about being a Hawkeye student, and will have a chance to ask any questions they may have. Get to know your new classmates and Hawkeye Guide. Orientation is an awesome opportunity to meet your new classmates and connect with current Hawkeyes. To make the most of your experience, I encourage you to be open to meeting new people and taking a step outside of your comfort zone. Also, get to know your Hawkeye Guide during your program. Hawkeye Guides know what it is like to be a student on campus and are more than happy to share their experiences and knowledge with you. 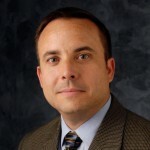 Plus, your Hawkeye Guide will be a familiar face on campus in August. Smile and wave if you see your guide after Orientation. They will love it, I promise! Explore Campus if you have a chance. If you have free time during your two days, walk around and explore the campus and Iowa City. Across the street from our campus, you will find the downtown area filled with a variety of restaurants, coffee shops, boutiques, and much more. Our city is beautiful and we love it! Want to show your friends and family how much fun you’re having on campus? Social media is the perfect place to do this. Use the hashtag #UIOrientation on your posts. If you have the best social media post in your program, you will receive a gift card to the Iowa Hawk Shop from Orientation Services. Get ready to post! Transitioning to college can come with a lot of uncertainty and questions. Orientation is a great place to have some of these questions answered before classes begin. Orientation is designed to be helpful and informative, but also really fun. Take advantage of the opportunities you’ll have in Orientation to enjoy yourself and be silly. Start your University of Iowa experience off on a positive note! Being able to call yourself a Hawkeye is awesome, and I hope Orientation will get you excited to be on campus in the fall! So, it seems like just yesterday my wife and I had two little girls; making sure we were doing all the right things to help them succeed academically, socially, and emotionally. Now, with one a junior in college and the other finishing her senior year of high school, I look back and wonder where the time flew! Start talking about college early. Late in middle school seemed about the right time for our family. Make sure your student is on the path to take all the college-required courses…and more to help provide a well-rounded academic and extra-curricular experience. Stop by a few campuses of different types and sizes during family trips before planning the official campus tour circuit. Encourage your student to keep track of their activities, honors and awards during high school; create an activities and awards resume. This will help later when applying for admissions and scholarships; even for internships during college. Help your student think about their interests, what careers might line-up with those interests, and what majors would be most helpful to land a job in those fields or to get into an appropriate graduate school program. There are many online career and college interest tools. A good one to consider is Big Future on The College Board’s website – https://bigfuture.collegeboard.org/make-a-plan or ACT Profile at http://www.act.org/content/act/en/products-and-services/act-profile/about-act-profile.html. When it’s time to visit college campuses with your student during junior year of high school (or sooner), keep track of important details and impressions of each visit. We found creating an Excel spreadsheet kept things organized, including: dates and details for our visits; deadlines for application, housing, scholarships and financial aid; major(s); costs of attendance; scholarships and other financial assistance offered along with actual out-of-pocket costs per year; etc. All of this information became invaluable in April of the senior year in high school when a final decision of where to attend needed to be made. One great way to check out college campuses early, is to encourage your student to attend a summer youth program. The University of Iowa has many opportunities for all ages; learn more at http://admissions.uiowa.edu/parents-family/youth-pre-college-programs. 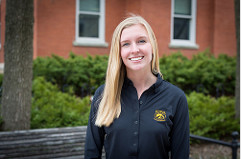 Many other resources to help you and your student in the college search process are located on our website at http://admissions.uiowa.edu/parents-family. So, start early, be encouraging, get organized, and let the search for that “right fit” begin! 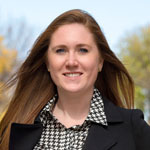 In today’s blog, I’ll be talking with Aubree Compton, an Advisor & Program Coordinator from the University of Iowa’s Study Abroad office who will be giving us the “inside scoop” on the benefits of going abroad, places you can study, and how to make it affordable! Most first-year students show up to campus bright-eyed and bushy-tailed, eager to tackle a new adventure with all the new-found freedom that college offers. From the moment you step on campus, you’ll realize there are SO many opportunities available to students looking to try something new. However, some opportunities require more planning and thought than others. It doesn’t take too much effort to sit in on a student organization meeting or check out an event that’s within walking distance of your dorm, but what about studying abroad? Studying abroad is a big commitment, but with the proper guidance and planning, you can make your study abroad dreams a reality. There are many reasons why you should look into this once in a lifetime opportunity, according to Aubree. 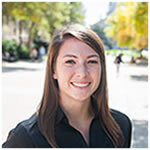 “Aside from an amazing educational opportunity, students develop skills which are attractive to employers – such as working with people from diverse backgrounds, handling ambiguous situations, and gaining self-confidence as well as interpersonal skills,” she says. There are quite a few options on where to go, what to study, how long and when to go. Aubrey tells us that the most popular programs include Spain, Italy, the United Kingdom and India. Students can study over their winter break, an entire academic year, over the summer, or either semesters. Iowa offers 168 sponsored programs around the world for students to study. Check out the Study Abroad Office’s interactive database to explore programs based on location and major interest. If there’s a specific university where you’d like to study and Iowa doesn’t currently offer a program there, the UI Study Abroad Office will work with you to make sure your classes transfer appropriately. This is partially why students should meet with someone like Aubree in advance to talk about options and necessary steps. If a student studies abroad through an Iowa-sponsored program, any merit-based scholarships will still be applied and deducted from their University Bill which helps studying abroad more affordable. There are also a number of specific study abroad scholarships for which students can apply! Studying abroad has become more and more popular not only at the University of Iowa, but across the country for students. SO, long story short: no matter which school you end up attending it’s always a good idea to look into the opportunities that you have as a student. Learn about Iowa’s study abroad programs on their website before becoming a student! And although I’d love to study abroad now, I doubt my boss will let me take three months off from work to vacation overseas!